Job titles matter a lot – and the words you use to describe your role will significantly impact the effectiveness of your resume. Spring semester of my junior year of college, just about every student in the advertising program at Boston University partook in a class called AdLab, which was designed to simulate the experience of working within a cross-functional team at an advertising agency. Each team consisted of an Account Executive, a Copywriter, and a Creative Director – which was my role, as the advertising/art major. The class served as our foray into creating portfolio-worthy work. It was exciting to have a real living, breathing client – most of whom were affiliates of the university who willingly lent their name and projects to the program in return for a free marketing campaign. The work itself was hardly as exciting as the prospect of telling future employers that I was, in fact, a Creative Director before I was even of legal drinking age. Clearly it positioned me as someone with extraordinary talent and unparalleled creative flair. I mean, right? Fast forward four years later, and I was managing a recruiting agency where I worked with REAL creative directors who had worked on award-winning international campaigns for the likes of Apple, and Adidas, and who educated me on what that title really denoted in terms of experience level and creative talent. It didn’t mean a college junior with an inflated title who had never actually worked in an advertising agency or met with a real client face-to-face. And certainly, recruiters and hiring managers would have shared that sentiment if I had been out there marketing my resume to Creative Director positions with hardly an internship under my belt. 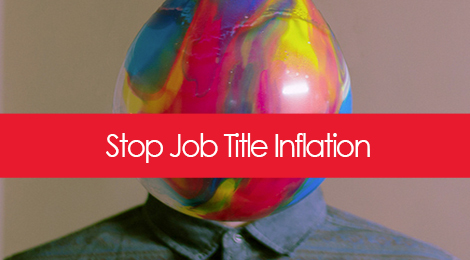 Job title inflation is rampant, and that’s not to say it’s wrong – I always encourage candidates to use verbiage that both accurately describes their role and contributions, but that also best speaks to the interests of the position. And of course, it has to respect corporate guidelines in the event that a background check is called for. But more than anywhere else, I see this as a challenge with candidates who have started their own companies. The last few years have spawned an uptick in entrepreneurship and freelancing, particularly among millennials, many of whom came out of college during one of the worst economic recessions in history compounded by a lack of available employment. Many sought alternative avenues for monetizing their skill sets, and this gave way to an entrepreneurial boom of sorts. And while this shift has created amazing opportunities for professionals across all industry verticals and experience levels, I often see people struggling to make the transition back into the traditional workforce from entrepreneurship, and a big piece of this is due to an inability to effectively market themselves accordingly. One thing they’re doing wrong is slapping a job title on the resume that says nothing about what they did, and/or conveys a completely different level of expertise than that which they’re targeting. This is so common among people who spend years working for themselves because you’re essentially determining your own job title, and we often shoot high. Or to the contrary, we default to the most sensical descriptor: “Founder”, “Owner”, or my lest favorite, “CEO”. And while describing yourself as the executive decision maker of a one (or five) person firm sounds prestigious in theory, job searching is not about prestige – it’s about relevance and fit. Many millennials are in a position where they came out of college and started or co-founded companies, or even began these positions while still in college. And as such, the first evidence of real employment on their resume is something of an entrepreneurial venture. The skills gained as an entrepreneur at any level offer potentially excellent selling points to employers, but only if presented in a relevant way. Time and time again I see young job seekers in particular making the same mistake of inflating their job titles. And there’s nothing wrong with referring to yourself as the CEO/Founder/Principle of an organization if you did indeed start, run, and essentially build it. But chance are you’re not vying for a CEO position or similar title, and as such, you might rethink the manner in which you describe your role in the organization. I started Brooklyn Resume Studio (and its former namesake Aspyre Solutions) back in 2009 while I was still working full time. And for awhile, I ran around calling myself the CEO, the founder, and a slew of other seemingly prestigious titles that probably impressed friends, but didn’t attract clients. The results were less than ideal, because saying that I was “the President of Brooklyn Resume Studio” doesn’t tell you a whole lot about what I do (with the exception that the name of the business gives it away, and this is not always the case). But if I were going for a full time role with another company, that detail would be insignificant, and the question would still remain as to what my contributions and responsibilities were as the President. Rethink that for a second and ask yourself which description provides more context: “President of Brooklyn Resume Studio”, or “Resume Writer & Career Consultant at Brooklyn Resume Studio”? So while calling yourself the CEO on your resume might sound impressive, it’s really not doing much to sell you towards the roles you’re actually targeting, and could actually be negatively impacting your results. After all, entry-level candidates typically have a few years to go before vying for the C-suite. This goes back to an important piece of advice I reiterate often, and that’s to think about who your target audience is when you’re creating and marketing your resume, or any other self-promotional piece. In other words, who is on the initial receiving end? This is the person you need to be speaking to in your writing, and a mid-level HR manager will not understand why 1) someone would describe themselves as a CFO with only 3 years of experience under their belt, and/or 2) why someone describing themselves as a CFO is applying for a Jr-Level Financial Analyst role. Think about what they are going to be looking, listening, and reading for, and make sure the words you use to describe yourself reflect that 100%. “But showing that I’m the founder of a startup is a good conversation starter for the interview, no?” Of course it is, and you should absolutely capitalize on that to show your range of skill and talent. But you have to lock down the interview first, and that means legitimizing on paper that you’re an ideal fit for the role. Anyone who’s started a company knows how much work is involved, and also the rewards it can yield. By no means am I suggesting you downgrade your accomplishments or experience, as I know just as well as anyone else how difficult starting and growing a business can be. And that’s a heck of an accomplishment that you should be bragging about. The difference between strategically marketing your experience, and sounding inflated, is in how you position yourself – are you a savvy entrepreneur who is both accomplished and open to continued learning, or are you projecting the image of sitting behind the mahogany desk of a Fortune 500 at the tender age of 22? Your job title is one of the first things hiring managers will look at on your resume, and one of the core criteria they will use to qualify or disqualify you when faced with a stack of 250 candidates (the average number of submissions for a typical job opening). So use this valuable real estate to pump yourself up in a way that proactively and strategically speaks to your audience. Particularly if you’ve worked for yourself, you have control and flexibility here to create the most compelling description. This is one case where labels ARE important, so be honest, be confident, but most of all, be relevant. Tags: career, entrepreneurship, job search, marketing, personal branding, resumes, shameless self promotion. Bookmark the permalink. I really like your title suggestions! I have been struggling with this for a few months now and you have provided clarity to my situation.